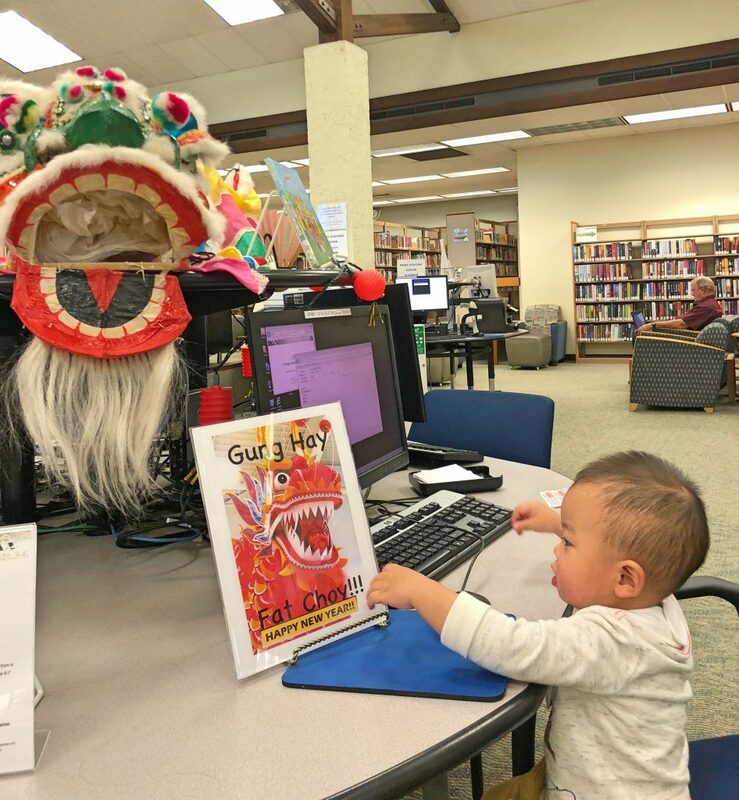 Chinese New Year is here in Anaheim, California at a local library when our grandson Julien saw a sign of GUNG HAY FAT CHOY and a costume lion used for traditional lion dance. Seeing off the Year of the Rooster, we are embracing the Year of the Dog. We have gained much in the Year of the Rooster. 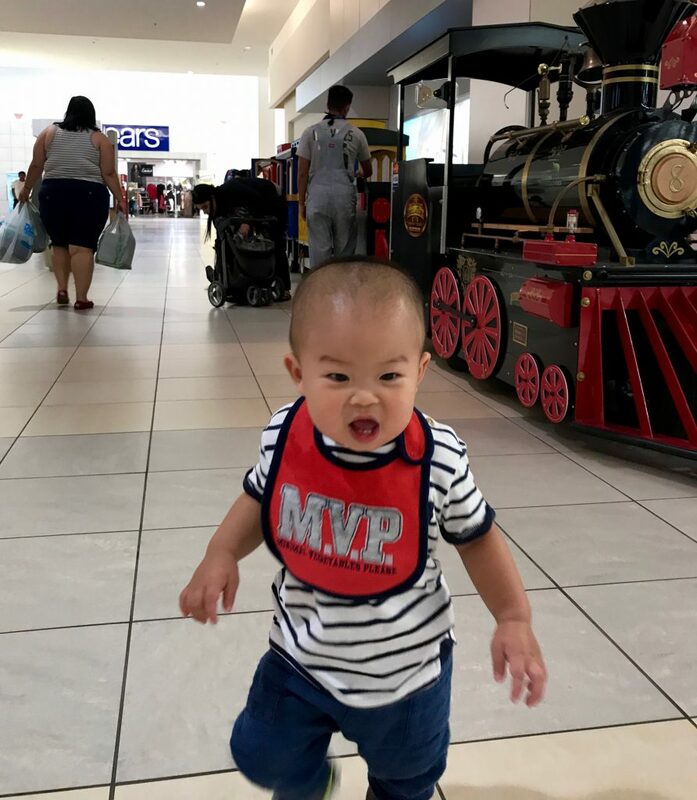 Our job to take care of our grandson is more time consuming but enjoyable after retirement. 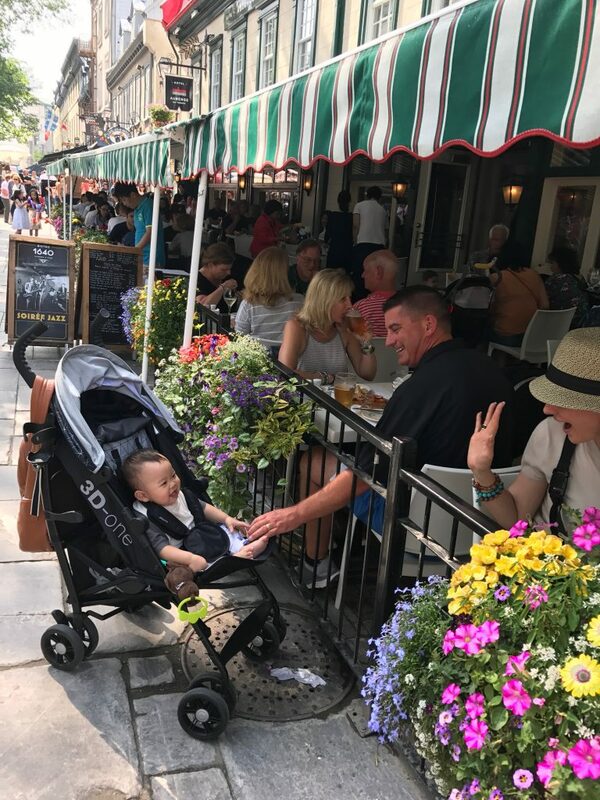 Our grandson Julien is the SUPREME LEADER in the family and we have to take care of our grandson and our dog Guai Guai. Yes, life is painful but enjoyable. 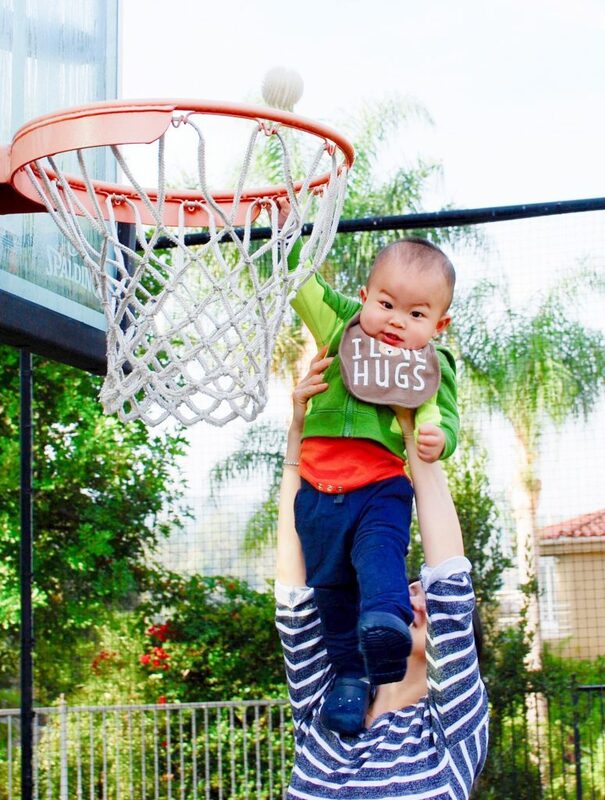 The laughter and cry of a baby in the family make our family life more meaningful. 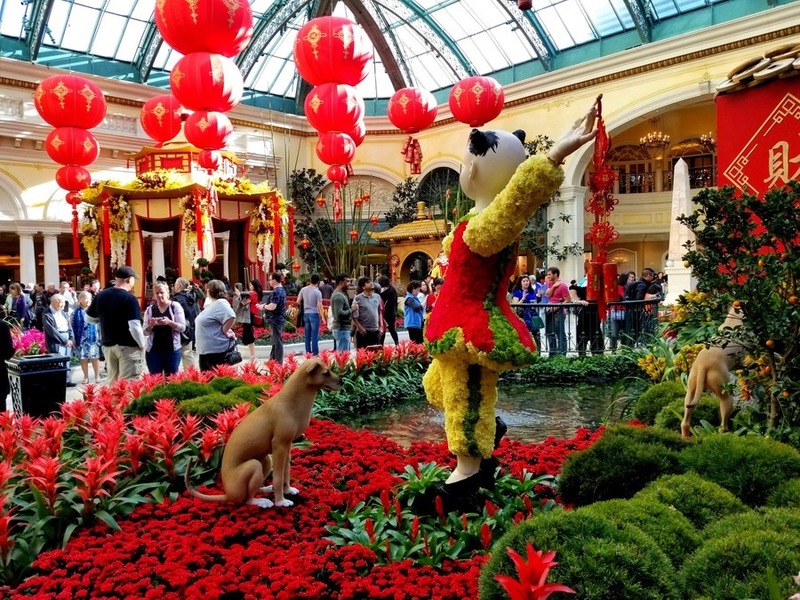 This is a scene at Bellagio in Las Vegas where the Chinese New Year is celebrated yearly. We like the festival atmosphere and would like to use this photo for our own celebration. 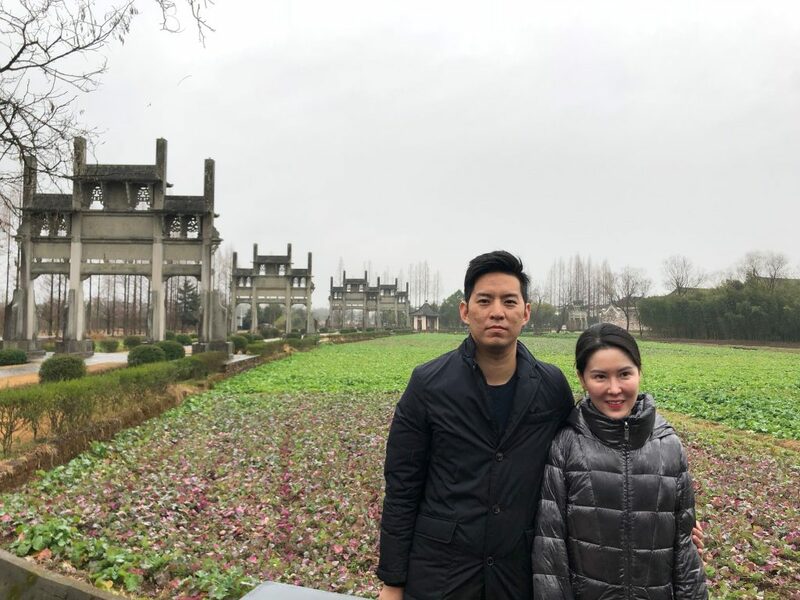 Now it is Guau Guai’s turn to make a show, but he is still playing the supporting role. 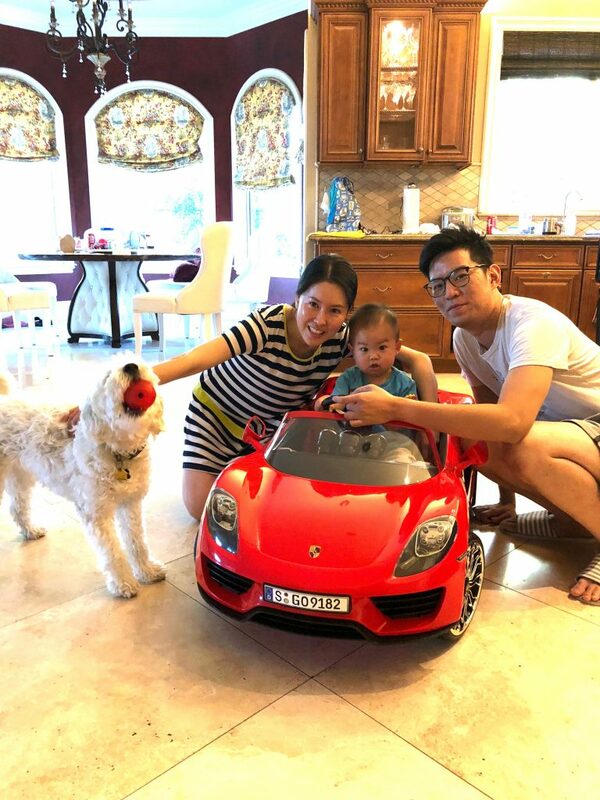 Julien is so lucky to have a new Porsche. What a wonderful life! Mom is always the first one to support her son and is willing to let her son step on her shoulder to climb higher. Wah! 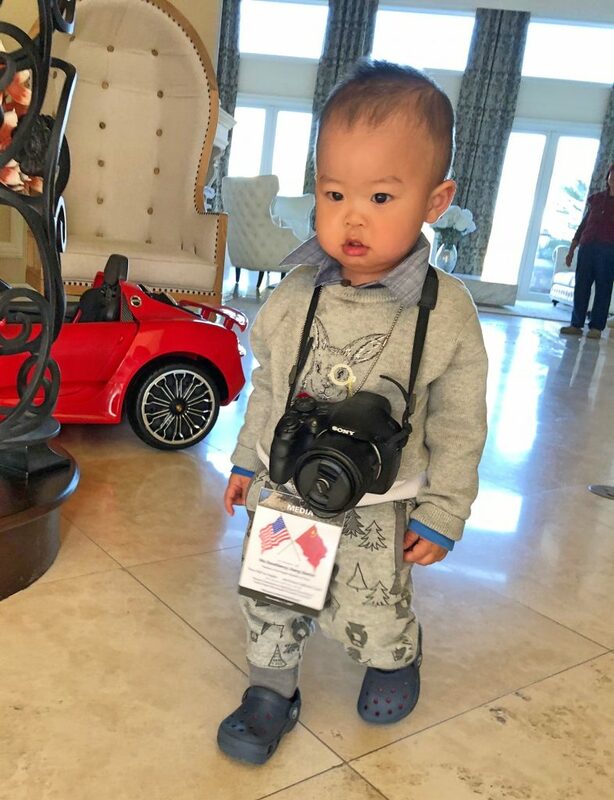 He looks like a little journalist. It is fun to report news, but when he grows up, robot may have replaced human to report news. OK, we have to seize the day, seize the time and run with the train. We visited Canada in July and look, Julien is so popular even in a small town in Quebec. He is smiling to almost everyone. It is so enjoyable to have dinner on the street! Look at the back, the couple tries to steal a show from Julien! 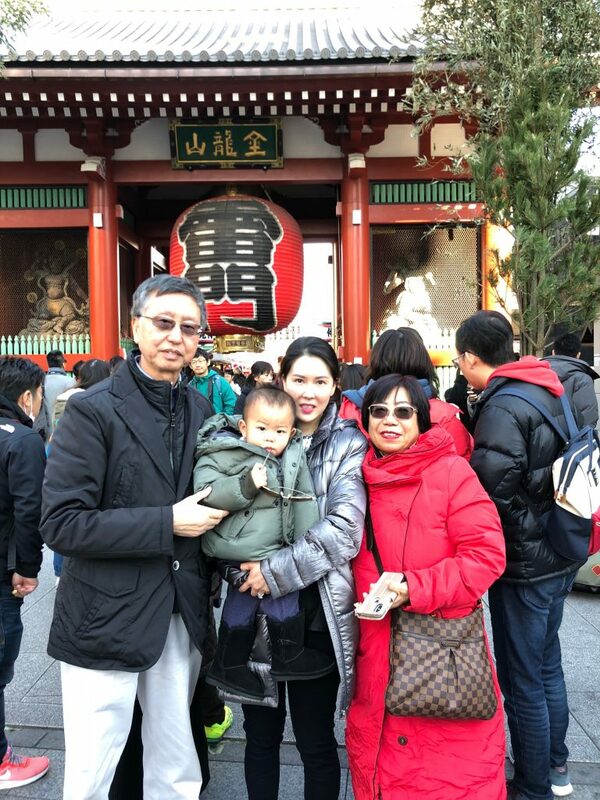 We also visited Japan in late December. It is in Tokyo, the Chinese characters say GATE OF THUNDER. 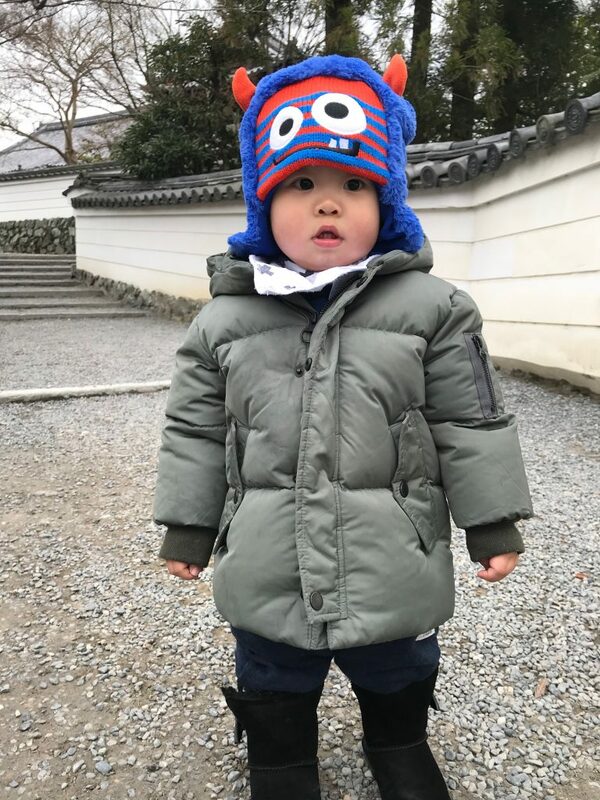 Julien stands before a temple in Japan, with all his winter clothes. 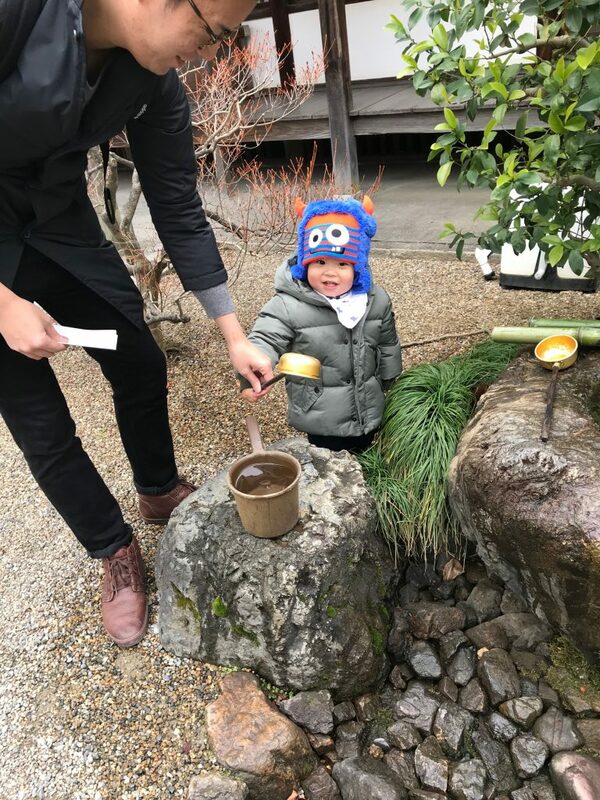 It is always fun to play with water. 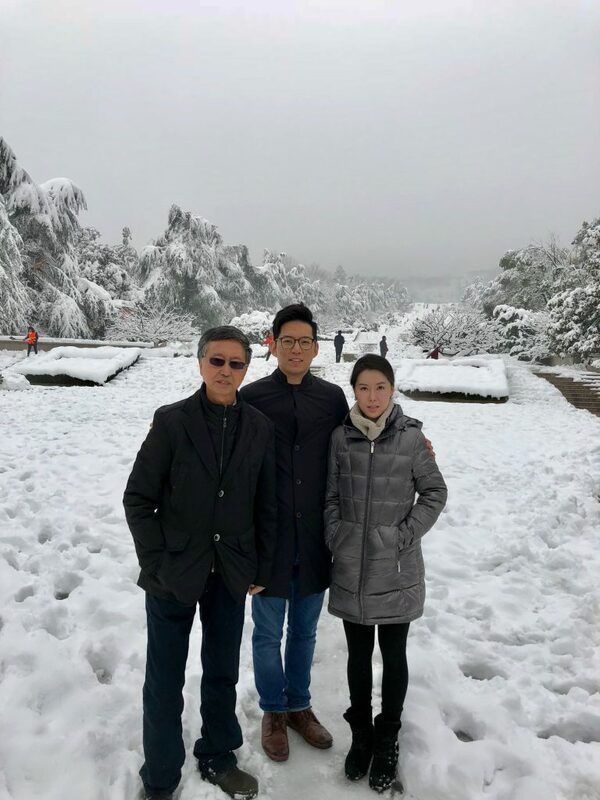 It is the first time that we came back to my hometown in Anhui together with our daughter Helen, son-in-law Tony and Julien. Helen is talking with her grandparents before their resting place. 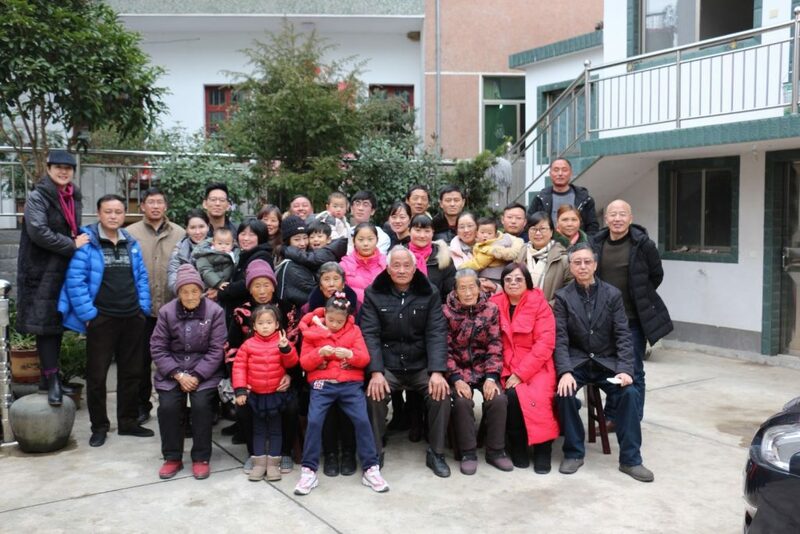 Our family is the miniature of China: seniors, middle aged, and babies. 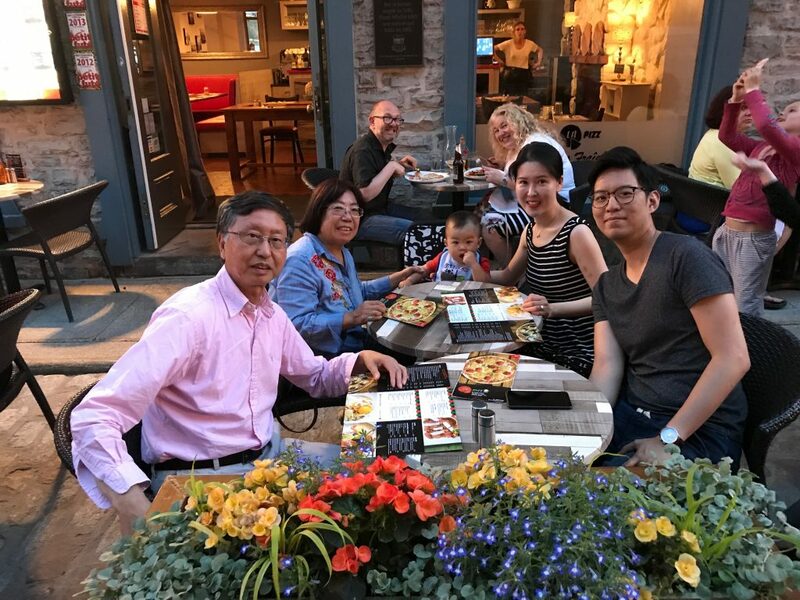 We come from Los Angeles, Zhenjiang, Hangzhou, Hefei and other places for a get-together. 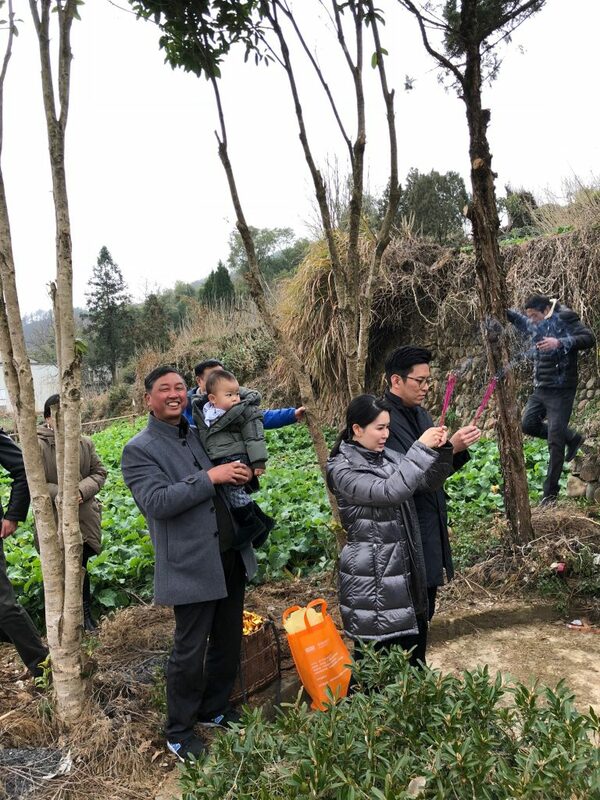 Tanyue is where the Bao family came from. 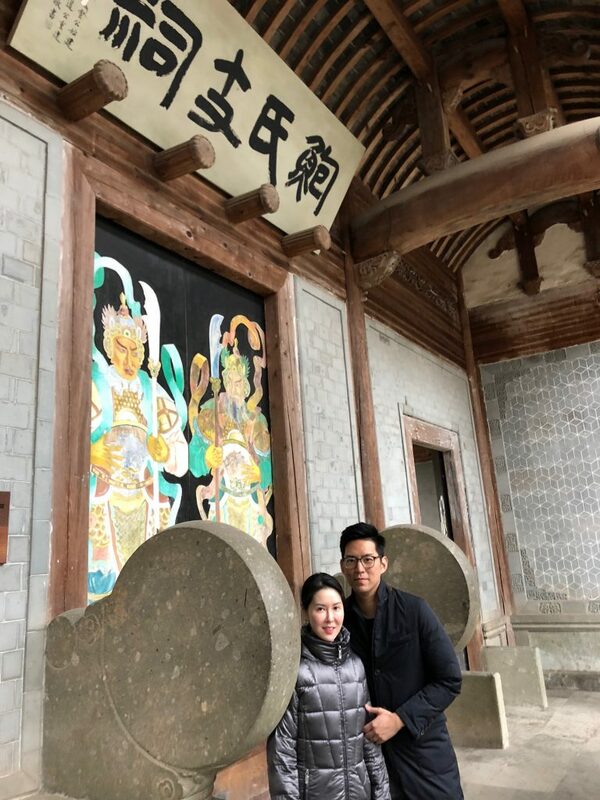 The only village in China where the Chinese emperos authorized 7 stone archways to be built for the Bao family. 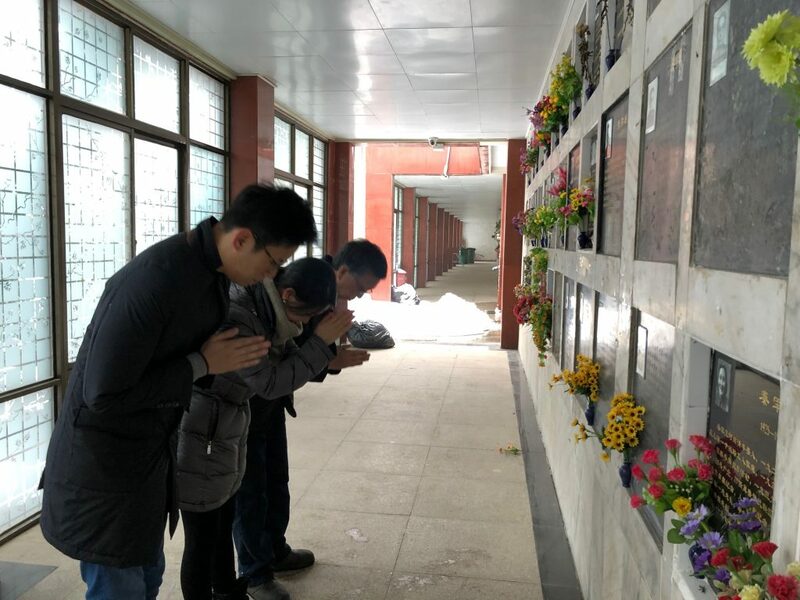 The remains of Baiqing’s parents were placed in Hefei, Anhui. Helen, Tony and I braved the strongest snow storm in 10 years to climb to the cemetery to pay respects to them. Helen has so many words to tell her grandparents who were so dear to her while together. 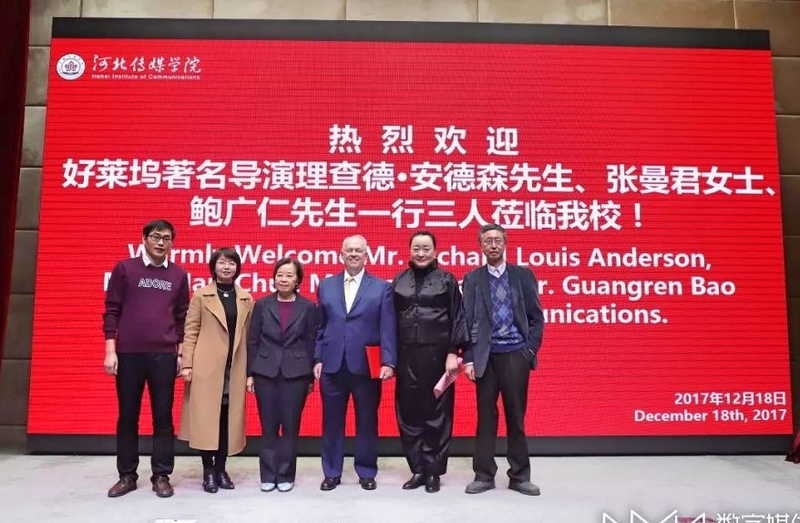 Besides visiting with the family, I also did something else: accompanying Hollywood director Richard Anderson to give a lecture at Hebei Institute of Communications. 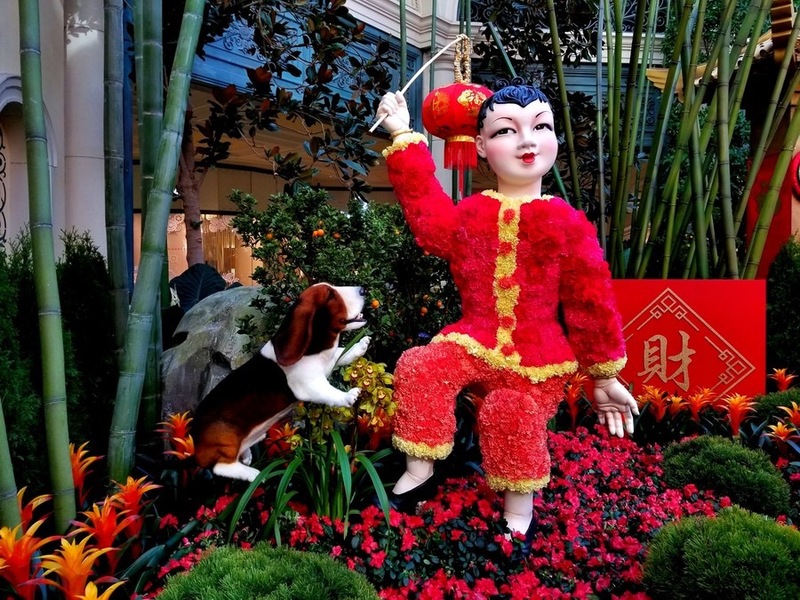 Let’s celebrate the Year of the Dog which will bring happiness and good fortune to everyone of us.